Protec has successfully pulled off one of its most demanding production support challenges ever, at the annual Sheikh Zayed Heritage Festival in Abu Dhabi. The event, which was held at the Al Wathba race track, celebrates UAE’s cultural inheritance as well as the diversity of other cultures around the world. The festival offered a variety of educational platforms, interactive performances, fountain shows, a tribal parade and a dazzling fireworks display each night. Protec were engaged for the fourth consecutive year to provide state of the art sound and lighting reinforcement for the 30,000 sq.m site. Not only was the scale unprecedented, but the event was so successful that a late decision was taken to extend the duration to two months, from early December to January 21st. Protec provided site wide inventory, deploying an elaborate Optocore dual redundant fiber network to transmit pristine audio to all the locations. Requiring some 2.6km of cable, this was all managed from a central control hub. 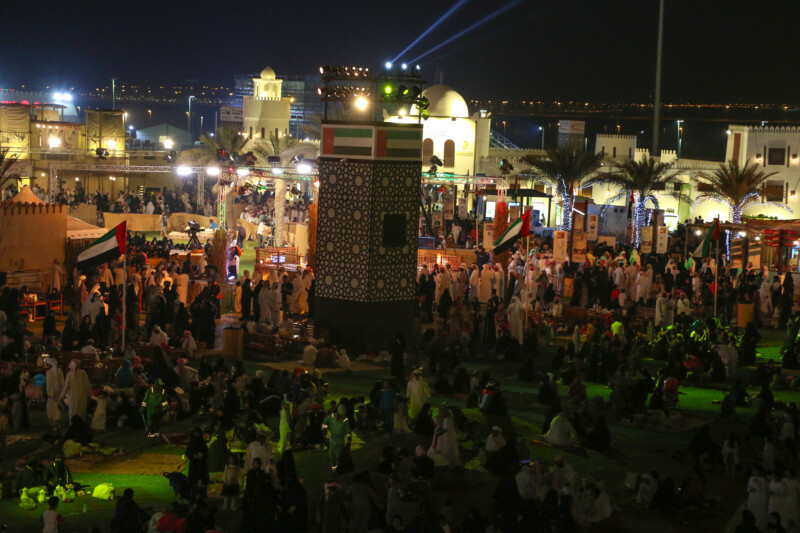 The deployment enabled them to carry out a range of tasks, from servicing 40 live interactive shows daily in dedicated traditional souks and time-coded fountain and firework displays, to providing an emergency announcement system and programmed call to prayer across the entire festival site. Immersed in their own unique cuisine and culture (including traditional dress), each of the souks presented four shows a day, making over 2,000 live performances over the 52-day duration of the festival alone. And with additional sound coverage required for the kids area, horses and Union Circle, Protec’s audio department had no fewer than 14 separate sites to manage over the vast festival grounds. In addition, the company dipped further into its large inventory to provide a separate sound system for an independent one-day event, Union March, in which tribes from across the Emirates marched to signify unity as part of the National Day celebrations. To oversee the deployment and operation of the massive technical infrastructure Protec fielded an experienced crew under the project management of Simon Travis. Daniel Dignan and John Francis took charge of the audio for the Heritage Festival with Tim Allison looking after the Union March, while lighting was in the capable hands of Geronimo Abad, Nelson Noche and Ferdie Caloy. Speaking of the challenges faced by his team, Simon Travis stated that in order to convert the site plan provided by the Ministry of Presidential Affairs into reality heavy investment in equipment had been required, notably the acquisition of 76 Electro-Voice SX300 loudspeakers. In addition to the audio, Protec specified a number of industry standard lighting fixtures from its cutting edge fleet. This included 24 Clay Paky Prima Super Sharpys, which were placed on the lighting towers to produce aerial effects, while no fewer than 100 Studio Due CityColor fixtures washed the outside walls. Once inside, the lighting magic further reverberated around the personalized souks. The Union Circle was the main hub of the event where the firework display and fountain show — which had been added for the first time — took place. Many people used this area to set up blankets and picnics on the grass surrounding the water. Ten towers were set up around the grass area in the Union Circle, each supporting 12 Cans facing out towards the festival, along with four Molefays, (two each side of the tower to provide a wash) and six Clay Paky fixtures (three Sharpys and three K20’s) facing into the center circle of the fountain to add both beam and general color effects, and highlight the UAE flag. All lighting was controlled from an Avolites platform. In a perfectly choreographed feature, the audio was triggered by timecode. Coverage for the Union Circle was via 32 x JBL VerTec 4889 line array elements, powered by Camco Vortex 6 amplifiers — again fed from the Optocore X6R network converters. A Soundcraft Si Compact digital mixing desk took inputs from a wireless Shure Beta 87 and a single channel from a Pioneer DJM900 Nexus mixer and CDJ2000 digital DJ deck, used for fountain music; the remaining channel provided the timecode. All channels, including two further firework inputs, were taken individually back to the DiGiCo SD9 for local playout in the center circle area. Protec were also tasked with lighting the rear pathways and areas around the mosques with LED floods and LED pars, while Pixelline 1044 LED battens and Molefays were used in the kids area. In this massive deployment of industry standard spots, profiles and washes, including 1000 conventional Pars, all fixtures had been detailed mission critical tasks. The biggest challenge had been equipping 10 of the 11 souks with concert grade lighting and sound. Each souk represented a specific country and their purpose was to showcase their heritage and culture by selling traditional clothes and authentic food as well putting on performances four times a day to show case traditional dancing and singing. Lighting in the souks was largely derived from Par Cans, boosted by 4-light Molefays, which gave a wider color wash to the surrounding pathways. For these center stages, Protec supplied 10 small Mackie ProFX12 desks as well as a number of mics stands, DI boxes and aux cables. Six small SX300’s were attached to the truss towers and Protec maintained master control so they could monitor the levels and insert the pre-programmed prayer times and emergency announcements. All limiting and compression took place within the SD9 to ensure no sound bleed between souks. In addition to the stages, Protec also lit the surrounding grass area. It had been Daniel Dignan’s task to maintain audio consistency across the 14 or so zones, including the general site-wide announcements, with all signals running back to the master control room via the elaborate fibre network. To accomplish this Protec deployed 76 of their new EV SX300’s, powered by L-Acoustics LA48 amplifiers, distributed around the souks and various event areas, and mounted on Total Fabrications XO lighting towers. “In total we took 29 lines from the site out of the LX4B and into an DiGiCo SD Rack and a Digico SD9, and sent 15 lines back out to the individual systems around the site,” explained Dignan. Other inputs into the SD9 came from QLab cue-based software, connected to the internet — which triggered the announcements. A further 16 outputs were supplied over the Dante platform by two Four Audio DBO1 Dante breakout boxes (for the souks), and allowed an extra channel to deliver important site wide announcements (and prayer), cutting all other inputs by 15dB as it did so. The fiber network comprised five Optocore X6R-FX interfaces, linked to the master control room where the signals ran into an Optocore LX4B FOH unit. Outputs to the Optocore X6R’s would automatically cut the QLab play back via a ducking gate on the SD9, and return to the pre-existing state at the end of the set. Union March was a one-off event attended by a host of dignitaries including the leaders of each of the Emirates and the King of Saudi Arabia and was broadcast on several channels throughout the Middle East. Tim Allison took charge of the PA and playback, as well as the microphones for the main grandstand. With a large parade ground to be covered, his PA included 40 x L-Acoustics K2 elements, with LA racks, again running over an Optocore fiber network and DiGiCo SD21 digital desk with D-Rack. Eight towers consisting of four L-Acoustics K2 were used to cover the grandstand, while a VIP area in the middle was served by a pair of K2, carefully positioned to preserve sightlines. As for Dan Dignan, he reveled in the unconventional nature of the sound design, stating that this was the first time he had experienced such a large fiber system. “This has to have been one of the most cable heavy jobs our audio department has ever done and we made it as efficient as possible; there were a ton of speakers, often a million miles away from the amps.